A mother must protect her two young daughters when a mysterious masked man stalks the family’s remote lake house. With her husband Shawn planning to arrive later, Laura takes her young daughters Kayla and Maddie to a remote lake house for their annual family getaway. While helping Maddie unlock the gate leading to the property, area resident Owen mentions that the family who previously lived in the house had a boy named John who went missing. After playing on a swing set outside, Kayla and Maddie follow a long red string leading to two cupcakes and a tea party setup on a tree stump. Maddie eats one of the cupcakes. Kayla hides the other cupcake in her dresser to give to Shawn later. Laura reads the girls a strange storybook titled “Darkness Hides” that belonged to John. Inside the book, Laura notices a handmade drawing of someone with two little girls on swings. Kayla wakes Laura during the night when Maddie gets sick. Maddie vomits up a small ribbon with the word “hello” written on it. Kayla tells Laura about the cupcakes. Laura inspects the cupcake Kayla saved and finds a ribbon with the word “goodbye” written on it amongst foul green filling. Laura finds that the landline is dead when she tries dialing 911. Laura, Kayla, and Maddie hear unsettling noises inside the house. Laura goes out to her car to search for her missing cellphone and finds a strange doll in the vehicle’s backseat. Laura collects her daughters and rushes them to the car. Laura starts driving away, but the wheels fall off the vehicle. After the car crashes, Laura races back to the house with the girls. The trio finds a family photo with everyone’s faces scratched out except for Laura’s. They also see a masked man, later revealed to be John, standing ominously outside in the shadows. Shawn arrives to find the gate locked. Shawn calls Laura’s cellphone and hears John breathing heavily on the other end. Shawn follows a red string to the tree stump where crude mannequins are positioned like a family in effigy around the tea party. John uses an ax to murder Shawn from behind. More strange noises are heard inside the house. John uses a recording of Shawn’s voice to lure Laura outside. Shawn’s dead body suddenly drops from the roof with its eyes gouged out. Laura rushes the girls outside once again. They find mannequins assembled on the swing set like the storybook drawing. John throws eggs at the trio, forcing them to retreat to the house. Laura briefly hides her daughters in an upstairs closet while she recovers Shawn’s car keys from Shawn’s body. Owen arrives at the house to investigate the commotion, but John kills him. Downstairs, Laura finds the strange doll as well as the storybook altered with handmade pages depicting John’s plan for killing everyone. John unexpectedly breaks through the front door and captures Laura. John plays a children’s song to lure Kayla and Maddie outside to Shawn’s car. The two girls find their mother bound and gagged in the trunk. John swings his ax blade into Laura’s side before chasing the sisters back to the house. John finds Kayla and Maddie hiding under a bed. John explains that he grew up in the house and had been stalking Laura’s family during each of their annual trips. John speaks cryptically about the storybook’s significance before flipping the bed and capturing both girls. By the light of day, John brings the unconscious sisters to his effigy collection at the tree stump where he plans to rebuild the mannequins from their body parts. Having recovered, Laura distracts John to initiate a fight that ends with Laura putting the ax into John’s back. John collapses to the ground. Kayla and Maddie reunite with their mother. Laura gets the girls in Shawn’s car and drives away. The sisters look through the back window and see that John’s body disappeared. 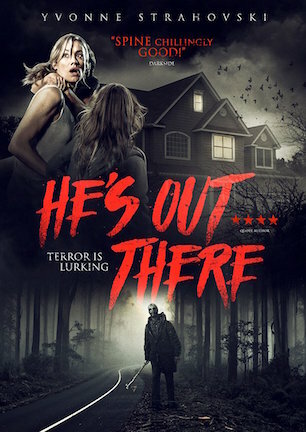 Botched marketing miscues never boded well for “He’s Out There.” Poster art progression in particular hints at a possibly sordid story behind the simple thriller’s iffy production pedigree. When the project was publicly announced in March 2016, “The Strangers” (review here) creator Bryan Bertino was said to be attached as a producer while Dennis Iliadis had been tapped to direct. As late as February 2018, well after the film presumably finished, Iliadis’ involvement remained loudly touted. Sales art promoting the movie for distributor courtship at EFM still proclaimed “From the Director of ‘The Last House on the Left’ (remake)” at any rate. A few months later however, media outlets, information sources, and ultimately the final film inexplicably listed the director as “Quinn Lasher,” a man with no other IMDb credits, online presence, public picture, or known identity to speak of. Whether he or the production no longer desired his association, speculation connected the dots that a nom de plume had replaced Dennis Iliadis in the credits. By this time, Bryan Bertino’s name no longer appeared anywhere either. More suspiciously, updated artwork added the pull-quote “spine chillingly good!” and attributed it to an outlet that hasn’t published a new review online since 2015. Even better, a four-star rating prominently placed next to the title hilariously listed “Quote Author” as its placeholder source. So, what kind of quality can be expected from a movie whose director used a pseudonym and whose publicist employed imaginary praise to drum up an illusion of acclaim? Take a wild guess. Boiled down to basics, “He’s Out There” doesn’t get more complex than “masked man stalks a mother and her two daughters at a remote woodland home.” Surprisingly given the recycled premise, several creative creeps nevertheless come into play. For instance, while not deserving of its own NECA action figure replication, the maniac’s mask strikes an effective fear factor for its streamlined design. His murder motif also features several handmade mannequins, a bedtime storybook with terrifying personalized pages, and the cryptic use of red string leading to a macabre milieu around a tree stump tea party topped with poisoned cupcakes. At some time, somewhere, possibly when Mike Scannell’s script originally titled “Scarecrow” made it onto the 2014 Blood List, “He’s Out There” seemingly had some depth involving a vague “Alice in Wonderland” allusion with unsettling psychopath vibes. None of that potential finds itself fulfilled in the film’s current cut though. “He’s Out There” slices off intriguing backstory buds like unwanted appendages, replacing them with tropes and cheats cribbed from the “Friday the 13th” franchise and every knockoff that followed. Does the landline get cut, preventing a 911 call? You bet. Do cellphones receive reception? Possibly, although the heroine leaves hers in the car during a conspicuous close-up telling us it isn’t in her possession anyway. Characters nonsensically separated? Hiding in a closet? Hiding under a bed? Disabled car? Creepy doll? Eerily echoing children’s song? Not verifying if the killer really died? Red herring neighbor with a peculiarly perfect sense of timing? Check, check, and check. Performances are passable. Yvonne Strahovski of “Dexter” and “The Handmaid’s Tale” never operates at a level less than absolute engagement in anything she does. Anna and Abigail Pniowsky do their jobs well as the young sisters too, crying, feigning fright, and exhibiting chemistry with believability. On the other hand, characters become beleaguered by dumb behavior. Not only does one girl eat a cupcake with gross filling strangely sitting out in the forest, her sister keeps the other one as a gift for dad, yet bizarrely hides it from mom for an unspecific reason that only make sense in a screenplay. Limited by too few people in one isolated location, “He’s Out There” quickly runs out of things for everyone to do. Three failed escape attempts result in the same outcome of simply retreating back to the house. That’s to say nothing of the additional treks outside to retrieve an item or check something only to end up back in the spot where that person started. Even though it is often uninteresting and always unoriginal, I wouldn’t say “He’s Out There” is so irredeemable as to merit complete disownment. After all, Dennis Iliadis kept his name on Blumhouse’s “Delirium” (review here) and that’s a duller film with fewer redemptive qualities. Then again, maybe one more routine horror movie, particularly a generic cabin-in-the-woods slasher like this one, isn’t a bad thing to keep off a résumé in need of another title audiences can refer to appreciatively. September 17, 2018 by Ian Sedensky.